Aviation Updates Philippines - Skytrax-rated four-star airline and flag carrier Philippine Airlines revealed its latest product offering for its upcoming Airbus A321neo and Airbus A350-900 aircraft to be rolled out in the near future. 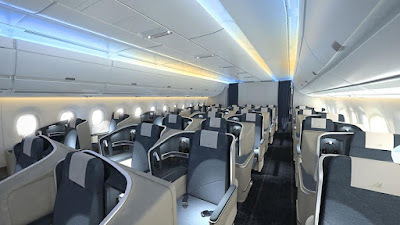 A321neo BUSINESS CLASS. This is the computer render of the Airbus A321neo business class section. Photo by Cielo Villaluna - Spokesperson for Philippine Airlines. Scheduled to be received by this year, these new Airbus commercial jets will feature PAL's newly improved in-flight entertainment systems across the cabin. The Airbus A321neo fleet, which PAL will receive six of the type this year alone, will showcase modern innovations in cabin layout and seat design that enable more efficient use of cabin space and ensure passenger comfort and convenience. This narrowbody jet will be configured with 168-seats in a dual-class configuration. A321neo BUSINESS CLASS. Photo by Cielo Villaluna - Spokesperson for Philippine Airlines. The business class section will offer 12 seats with personal IFE screens, a full flat recline feature, and a generous legroom of 60 inches and seat width of 20.5 – 23 inches. A321neo ECONOMY CLASS. Photo by Cielo Villaluna - Spokesperson for Philippine Airlines. 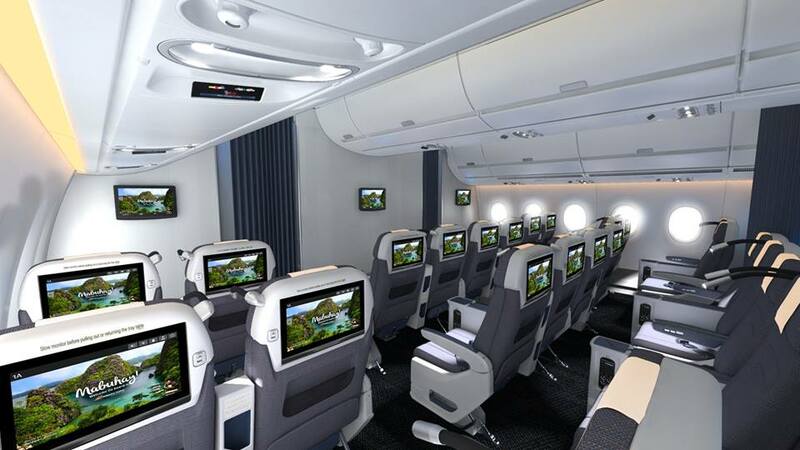 The economy class, however, will have 156 seats each featuring myPALeSuite Personal TV screens, a legroom of 31-32 inches and a width of 18 inches as well as an incline of 5 inches in a 3-3 cabin layout. 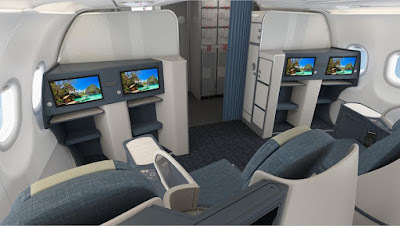 PAL's new widebody aircraft, the Airbus A350-900, will also feature an upgraded state-of-the-art cabin for better passenger comfort and safety on longhaul flights around the world. 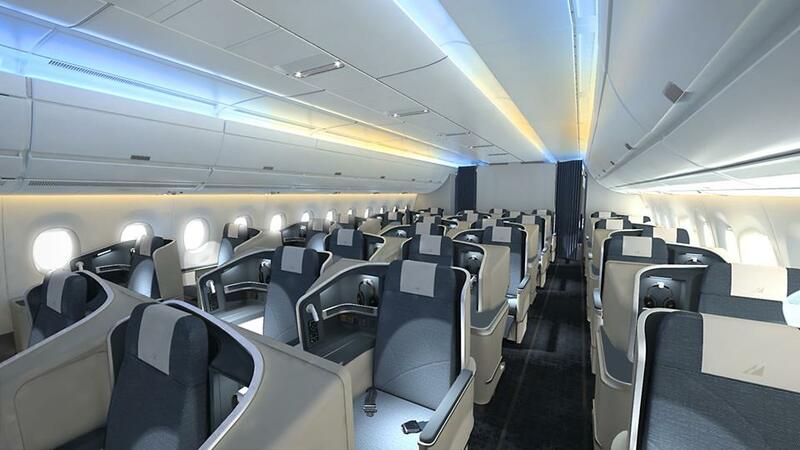 A350 BUSINESS CLASS. Photo by Cielo Villaluna - Spokesperson for Philippine Airlines. 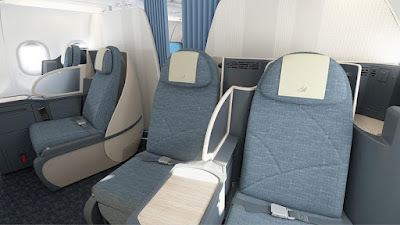 The aircraft's business class section will have 30 seats in a 1-2-1 dual-aisle cabin layout. 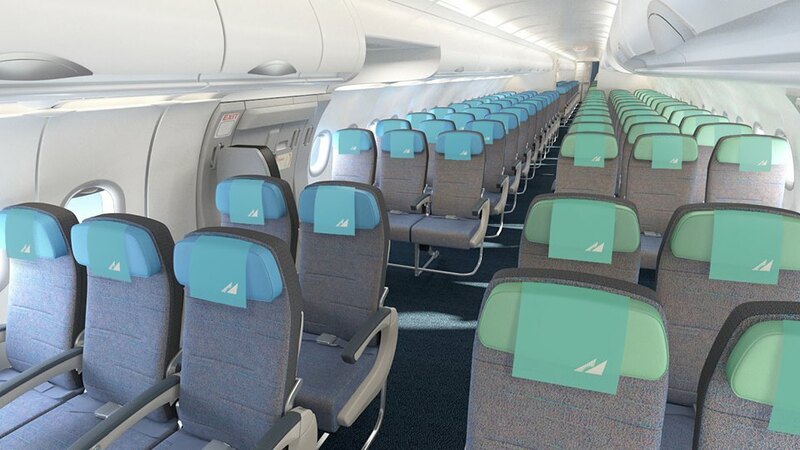 Seats will have a legroom of 44 inches and a width of 23-24 inches. It will also be able to recline to full flat measuring 78 inches in length – has an air cushion to adjust seat firmness, a lumbar massage feature, additional storage for personal items and power ports. A350 PREMIUM ECONOMY. Photo by Cielo Villaluna - Spokesperson for Philippine Airlines. The 24 premium economy seats will have a 2-4-2 configuration with a legroom of 38 inches and a seat width of 19 inches. 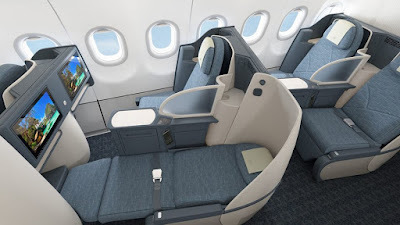 According to PAL, premium economy seats – which have a recline of 8 inches – are equipped with leg rest and footrest, additional front pockets for personal items, bottle holder, reading light and power ports. 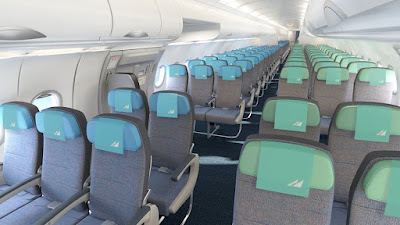 Lastly, the economy class section, with 241 seats, will be in a 3-3-3 configuration with 33 inches of legroom and 18 inches of seat width capable of reclining up to 6 inches. It also features a 4-way headrest and USB power ports. 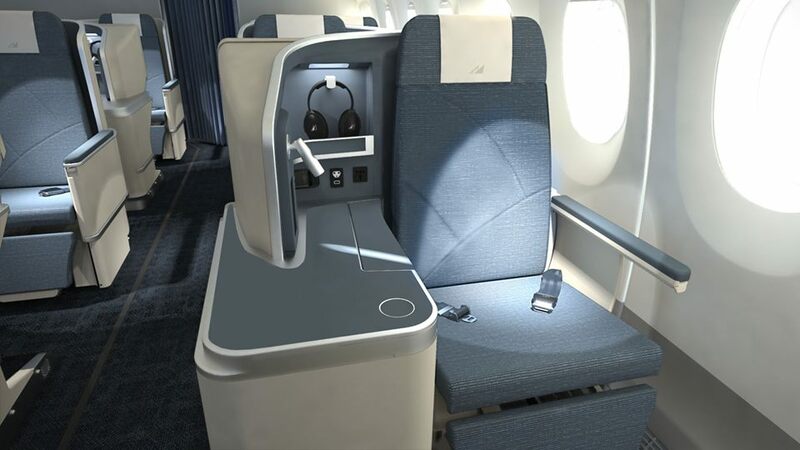 The Airbus A350 cabin offers mood lighting for a more relaxing stay across the flight. 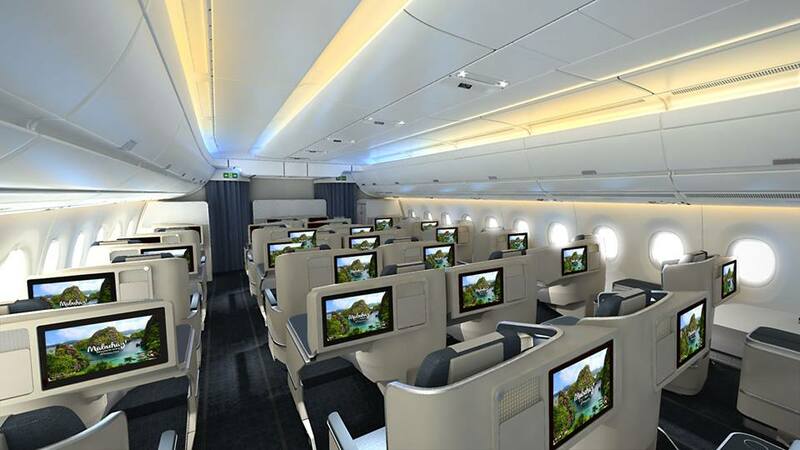 Each seat in each cabin will feature personal IFE TV screens for passenger entertainment. Free WiFi connection will also be featured subject to time and volume caps. Continuous improvements on passenger service are part of PAL's strategy as it aims to gain its five-star rating in the coming years. More aircraft will be added to its fleet as it expands to more domestic and international destinations in the next few years. PAL is set to receive six Airbus A321neoLR, 15 Airbus A321neo ACF, and six Airbus A350-900 XWB aircraft.